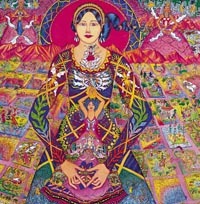 Front of card is a scaled reproduction of "Utopia", the 1993 oil painting by Barbara Mendes. Send this card to your friends who love beauty. The peaceful gaze of the towering woman; the rich colors and complex imagery; may make them save your greeting to be savored.